State Representative Harold Dutton, Jr. has introduced a bill in the Texas Legislature to amend Texas’ Open Beaches Act. What does this have to do with oil and gas, you may ask? Read on. Last year, the Texas Supreme Court decided a case interpreting the Open Beaches Act, Severance v. Patterson, 370 S.W.3d 705 (Tex. 2012). The case arose because of Hurricane Rita. Carol Severance owned two beachfront houses on Galveston Island, as rental properties. Because of Hurricane Rita, erosion shifted the beach vegetation line farther landward, causing both homes to be located on the dry beach facing the Gulf of Mexico. As a result, under the Open Beaches Act, the Commissioner of the General Land Office informed Severance that she would have to remove the houses and offered her $40,000 assistance to relocate or demolish them. Severance then sued the Commissioner in US District Court claiming that the Commissioner’s action constituted a taking of her property without compensation under the Fifth Amendment of the US Constitution. Her case was dismissed, and she appealed to the 5th Circuit Court of Appeals. That court, after analyzing the case, concluded that Texas law was unclear on the matter, and it submitted “certified questions” to the Texas Supreme Court. To understand the significance of Severance v. Patterson, it is necessary to go back a ways, to the Texas Supreme Court case of Luttes v. State, 324 S.W.2d 167 (1958). In that case, Mr. Luttes was claiming to own about 3,400 acres of “mud flats” lying on the edge of the Laguna Madre in Cameron County. 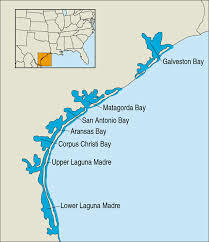 The State of Texas holds title to all submerged lands along the coast, including lands within the Laguna Madre, the long, shallow lagoon that runs between the mainland and Padre Island along much of the Texas Gulf Coast. Mr. Luttes contended that these mud flats were part of his “dry land”, and not “submerged land” belonging to the State. The original grant within which Mr. Luttes’ land lay was, like much of the land along the Texas Gulf Coast, originally granted by the King of Spain when Texas was a Spanish possession. When Texas gained its independence, it recognized the validity of land grants previously made by Spain and Mexico within its territory. Issues regarding title to original grants in Texas are decided based on the law in effect at the time the grants were made – in Mr. Luttes’ case, the law of Spain. So, in deciding Mr. Luttes’ case, the Court had to determine how the boundary between land and the sea should be determined under Spanish law in effect at the time of the original grant. The case was the first time the Texas Supreme Court had addressed this question. The Spanish law addressing this question, as recognized by the Court, is known as Las Siete Partidas, or “The Seven Parts,” compiled in the 13th century. Spanish law declared the shore of the sea to be public property, available for all to use. A part of that law says: “and all that place is called shore of the sea insomuch as it is covered by the water of the latter, however most it grows in all the year, be it in time of winter or of summer.” Because of its Spanish heritage, Texas has long considered its beaches public property — unlike many states whose antecedent law is the common law adopted from England, which holds that the dry beach above the ordinary reach of the tide is private land. The Court in Luttes decided to adopt a “scientific” approach to mark the boundary between the sea and the land, borrowing from a US Supreme Court case decided in 1935 that addressed the question of the location of the shore boundary in California. The Court held that the boundary was “the line of mean higher high tide,” determined by the average of the reach of the tide each day during a seven-year tidal cycle. The Luttes decision caused a huge controversy when it was decided, because it meant that the “dry beach,” the area between the “wet beach” and the line of vegetation — what the public understood to be its public beach — was in fact private property. If the public wanted to use the beach, it would have to wade in the water. As a result, the Legislature passed the Open Beaches Act. That Act declares that the public has an easement over the dry beach for its public use. And, since it was well known that beaches often erode, leaving homes and other structures originally built behind the line of vegation out on the beach, the Act created a mechanism for requiring removal of those structures. Private owners are never happy when this occurs, and there have been numerous cases involving the application of the act since it was passed, but until last year it was generally believed that the Open Beaches Act had solved the problem created by Luttes, at least as far as the public’s use of the beaches was concerned. That is, until Severance v. Patterson. But what, you ask, does this have to do with oil and gas? Be patient. Texas beaches have always been open to the public. The public has used Texas beaches for transportation, commerce, and recreation continuously for nearly 200 years. The Texas shoreline is an expansive yet diminishing public resource, and we have the most comprehensive public beach access laws in the nation. Since its enactment in 1959, the Texas Open Beaches Act (“OBA”) has provided an enforcement mechanism for the public’s common law right to access and to use Texas beaches. The OBA enforces a reasoned balance between private property rights and the public’s right to free and unrestricted use of the beach. Today, the Court’s holding disturbs this balance and jeopardizes the public’s right to free and open beaches. Because of continued erosion along the Texas shore and gradually rising water levels, it is feared that the public’s right to use Texas beaches will continue to be eroded — a direct result of the Texas Supreme Court’s rulings in Luttes and Severance. Representative Dutton’s House Bill 325 is an attempt to overturn Severance by declaring that the “public beach” is “any beach area, whether publicly or privately owned, extending inland from the line of mean low tide to the line of vegetation bordering on the Gulf of Mexico, as the line of vegetation may shift over time as a result of avulsive events or other forces of nature.” It is not clear whether his bill has any chance of passage, or whether, if passed, the Court would be willing to recognize the public beach as the bill re-defines it. So, what does all of this have to do with oil and gas? The boundary between the sea and the land marks not only the line between the State’s ownership of the seabed and private upland, but also the line of the State’s ownership of minerals under submerged land. Texas owns title to minerals under the Gulf of Mexico extending three marine leagues from the shore. But a large portion of Texas’ submerged lands lie within the Laguna Madre, which stretches from Brownsville to Matagorda Bay. Laguna Madre is in most places very shallow, two feet or less in depth. Wind-driven tides cause huge areas of the laguna to be sometimes dry, sometimes inundated. The Intracoastal Waterway, constructed by the US Army Corps of Engineers in the 1930’s, runs the length of the laguna and allows for navigation. 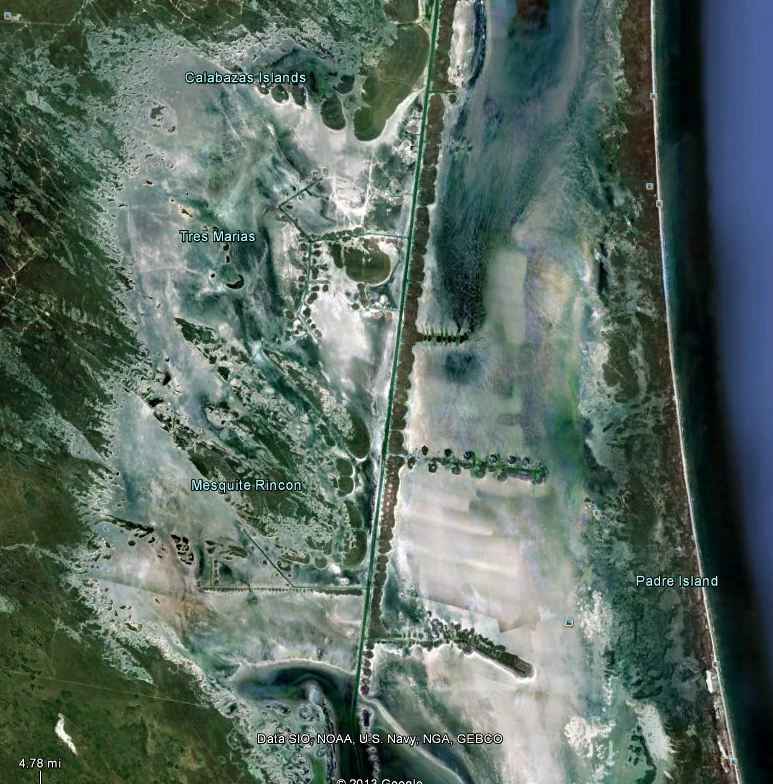 There is one area of the laguna, called the “land cut,” located in Kenedy County, which is often totally exposed, from the mainland to Padre Island. It serves to separate the northern and southern segments of the Laguna Madre. In some seasons of the year it is covered with water – in other seasons it is dry mud flats. Below is an image from Google Earth of the land cut. The entire area encompasses about 35,000 acres of land. Beginning in about 1996, our firm represented the Texas General Land Office in a dispute with the John G. and Marie Stella Kenedy Memorial Foundation over title to the land cut. The Kenedy Foundation owns the lands to the west of the land cut, given to the Foundation by Sarita Kenedy East. The Ranch encompasses some 235,000 acres, one of the largest ranches in Texas. The Foundation argued that the land cut, under the rules for location of the shore boundary established by the Texas Supreme Court in Luttes, was dry land and part of the original Spanish and Mexican grants making up the Kenedy Ranch. The State argued that the land cut – sometimes dry, sometimes inundated – was part of the bed of the Laguna Madre, owned by the State. The fight, of course, was not over the land, a vast mud flat wasteland, but over the mineral rights to 35,000 acres along the Texas Gulf Coast. After a jury trial, the trial court entered judgment holding that the State owned the disputed land. That judgment was upheld by the Austin Court of Appeals. In December 2000, the Texas Supreme Court affirmed. But the Kenedy Foundation asked the Court to reconsider, and in 2001 the Court agreed to rehear the case. During the interim, several supreme court seats on the court changed hands. Finally, on August 29, 2002, the Court withdrew its prior opinion and issued an opinion reversing the courts below and holding that the entire disputed area belongs to the Foundation. Three justices dissented. In effect, the Court ruled that the “shore” of the Laguna Madre adjacent to the Kenedy Ranch lies along the edge of the Intracoastal Waterway, a man-made channel. I’m sure that the Court in 1958, when it decided Luttes, had no idea that it was giving away thousands of acres of submerged land in the Laguna Madre, or allowing the public’s access to beaches to disappear. Nevertheless, this has been the result. With the introduction of House Bill 325, the fight over the coastal lands and beaches along the Texas shore continues. A footnote: The author of the Luttes opinion was Justice St. John Garwood. He was the father of Will Garwood, at one time a member of our firm and later a judge on the 5th Circuit Court of Appeals. St. John Garwood was of counsel to our firm after he left the court, and he was still coming to the office when I joined our firm in 1978. Justice Garwood’s most notable opinion during his time on the court was Luttes. His wife, Ellen Clayton Garwood, was a member of the prominent Clayton family of Houston and was known for having donated $2.5 million to conservative groups backing the Nicaraguan contras during Ronald Reagan’s presidency. She testified in support of Lt. Col. Oliver North in the contra hearings before Congress. Her father was William L. Clayton, who served as Under Secretary of State in the Truman administration.